The regularly scheduled meeting on September 11, 2017 has been cancelled and rescheduled for September 14, 2017 at 4:00 p.m. The SWFD Administration offices will be closed on Monday, September 11, 2017 due to Hurricane Irma. 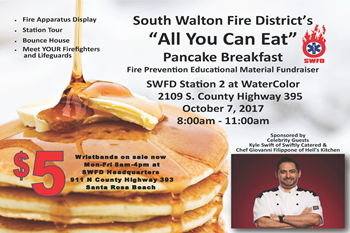 The South Walton Fire District (SWFD) Firefighters Retirement System Pension Board will hold a special meeting on August 28, 2017 at 3:30 p.m.